Updates on our latest publications; previews; reviews and syndicated posts from respected authors. Love is love and dragons are evil or are they really? 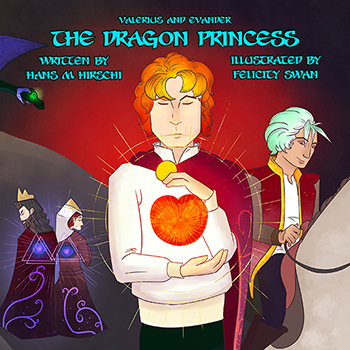 The Dragon Princess is a story about love and how it holds the power to transform even the coldest of hearts. A classic bedtime story for children of all ages written by bestselling author Hans M Hirschi and beautifully illustrated by Felicity Swan. It's a [very] long time since I read a traditional fairy tale for me rather than for children or [cough] grandchildren. My favourites were The Magic Porridge Pot and The Enormous Turnip, although I recall being in awe of the intricate embroidery work on Cinderella's ballgowns, and Rumpelstiltskin scared the life out of me, as did Hansel and Gretel. The classic fairy tale books of my younger childhood contained a good deal more story than modern fairy tales, or perhaps that's just how I remember them. Either way, the first time I set eyes on Hans M Hirschi's The Dragon Princess, it felt like a proper fairy tale, made all the more beautiful by Felicity Swan's rich, vibrant illustrations. And, of course, it has all the necessary elements of the classic fairy tale: a love that transcends social barriers, a terrifying yet (potentially) redeemable adversary, and a happily ever after. Available from Beaten Track Publishing and all the usual vendors. *Organisations wishing to stock The Dragon Princess or any other Beaten Track title, please contact us for a quotation. Discounts may be available. Hans M Hirschi has been writing stories since childhood. As an adult, the demands of corporate life put an end to his fiction for more than twenty years. A global executive in training, he has traveled the world and published several non-fiction titles as well as four well-received novels. The birth of his son provided him with the opportunity to rekindle his love of creative writing, where he expresses his deep passion for a better world through love and tolerance. Hans lives with his husband and son on a small island off the west coast of Sweden. New Release: Closer by F.E. Feeley Jr.
BIKE BOOK REVIEWS: BEATEN TRACK WEEK WRAP UP POST WITH GIVEAWAY!